Ah, so you want to know what people are thinking? Prefixed your name with Madam and affected an over-the-top Romany accent. Joined weekly cult meetings at your local Indian burial ground… or Starbucks, weather permitting. Before you get too carried away, let’s explore a slightly different approach. Mind reading is very possible. But let’s get one expectation straight, you aren’t going to suddenly be able to extract the deepest, darkest secrets from some innocent bystander. You’re not even going to find out what they had for breakfast, unless of course you ask them or you spot remnants of bacon and eggs in their beard. This isn’t about by tapping into your telepathic abilities or channelling spirits from beyond the nether regions. This is about gaining enough understanding that you can make some pretty darn useful predictions about what someone is thinking in a certain situation. You’ll become adept at guessing the questions people will be asking both actively and subconsciously. Some questions we very much know we’re out to find answers for, others our brain is poking away behind the scenes and bubbling up the answers in terms of choices and decisions. It’s these choices and decisions that we’re looking to influence. No mystical powers, just the ability to understand the basis of how people think and provide the answers to the questions floating around in their minds. The trick to this form of mind reading is to understand the underlying reasons people think the way they do. Every one of us has certain thinking patterns that have formed from evolutionary reasons, our cultural surroundings and from our learned processes. These ways of thinking are summarised by the 7 Creatures of Habit. By understanding where the Creatures manifest, we can reverse engineer them to predict how people are most likely to think and act based on what they want, need and desire. So fling open the curtains, blow out the candles and remove your bejewelled headdress. This is about to get real. 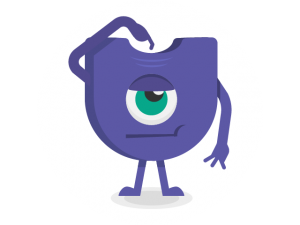 Let’s explore how to use the Creatures of Habit as mind reading sidekicks. Routine ensures thought patterns really get embedded deep. It’s the mental equivalent of the bum print in your favourite sofa cushion. Is this something I’m familiar with? Am I going to have to go out of my way? Do I feel comfortable with this experience? Is this too much of a disruption from my typical ways? Now the challenge is to start answering the questions to satisfy Routine’s comforting desires in the mind of the person you are looking to influence. We all have a certain pattern to our lives. We will buy the type products, go to the sort of places and act in the certain ways we’ve done before. Basically, you are what you repeat. Our Routine habit is hunting what’s called cognitive fluency. Simply put, it’s easier to comprehend and act on what we’re used to. Why do many fashion sites look pretty similar? A case of lazy designers right? Wrong*. It’s more a case of lazy shoppers. The familiarity means visitors don’t need to overthink things. They already know how to navigate and take action. Introducing different layouts and actions means Routine is bumped off auto-pilot and moves out of its comfort zone. People are then going to have to spend more precious time figure out if it’s relevant and appropriate. *That doesn’t mean designers need to just sit back and copy (though many will do just that- just wait until we come to the Follower habit). 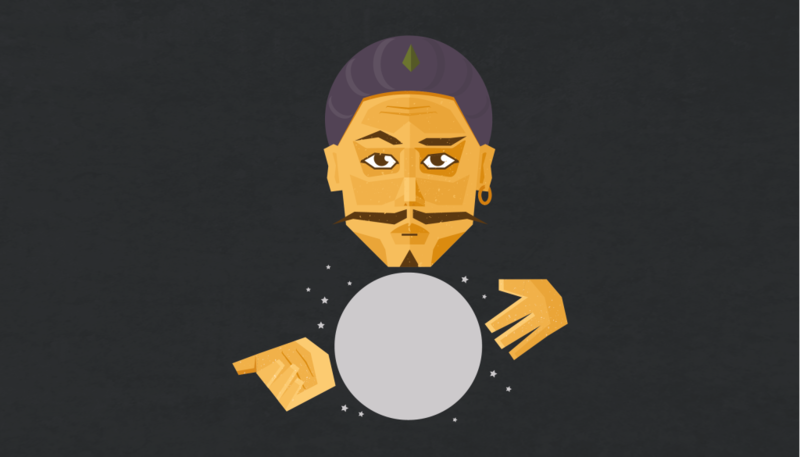 The trick is predicting how people are most likely to engage then layer on creativity to generate a unique experience that heightens desire for the individual brand. The more you see something, the easier it becomes to think about and recall. There’s even a term for this: The Mere Exposure Effect. Basically, the Routine habit gives preference to the things it’s exposed to more often. It’s the acquired taste, that song that grows on you, your loving partner who initially drove you up the wall. Familiarity eventually creates an unbreakable bond. So it’s simple- if you want to influence someone’s actions, find more ways of getting in front of their face. If you are expecting someone to suddenly adopt your new product and live happily ever after, think again. Some will but the majority are like cattle- happy enough in their green pasture until given enough of a prod to move into the next field. The most effective products are engineered with multiple reminders and activity touchpoints so you are encouraged to naturally find your feet and become familiar. I was very impressed when I started learning a new language with Duolingo. Their on boarding process gives you a taste of how it works during the sign up process in a very game-like way (creating early familiarity), plus they ask you to choose your level of commitment to get reminders to learn at the pace you’ve set for yourself. They make it hard to forget about them! Someone has done a nice job of documenting this approach here. One offs aren’t effective. Repetition wins. This is why internet remarketing is so effective. You know when you visit a website then you see ads pop up elsewhere, prompting you to ask questions such as, “How on Earth did Facebook know I was interested in that hot waxing kit?!”. In fact, Hubspot claims that users who are retargeted are 70% more likely to convert. Also consider this: 47% of buyers viewed 3-5 pieces of content before engaging with a sales rep. (Demand Gen Report, 2016). Now you have that nugget, you realise half of the population will automatically be rejecting your sales pitch on first contact. Instead, the mind-reading sales person will be ready to spot when someone has viewed enough content to heavily tilt the odds of a receptive prospect in their favour. By knowing what they like, that sales person can now come across as familiar with their needs and helpful and not a jerk from out of the blue. People are far more likely to comprehend and adopt something if they are able to create analogies with what they already know. There seems to be a trendy formula with new app-based services that goes like this: We’re the Uber of [insert service here]. Any traditional activity that is now on-demand via an app start their pitch with “We’re the Uber of…”. There’s just about an ‘Uber of’ everything you can imagine. Whilst you don’t need to rush out and start coding ‘the Uber of chimney sweeping’ , you can certainly use the concept of using existing understanding of products and services to create a shortcut to understanding. If you do anything new, people instantly want to know, “What is it replacing or improving?” or, “ What is it an alternative to?”. Be ready to answer these questions and you’ll have more time to direct people towards the nitty gritty without them getting bogged down working things out for themselves. It’s not all about technology either. Providing analogous frames of reference can be instrumental in influencing people’s thinking and decisions. I once heard a story of a company director that refused to take on board the idea of mixing up the staff in the office to work within different teams. However, he was told the story of the Dutch Total Football team from the 1970s. This team’s training strategy involved players switching positions to get a wider perspective of everyone’s role and be more adaptable when playing. The team became legendary because of this. That analogy was the trigger for this director to a) get over himself and b) realise switching around staff could be something well worth trying to increase team collaboration and performance. It’s not even just direct analogies. I recently worked on a proposition for a new frozen yoghurt drink. Let’s be honest, there’s not a huge existing direct frame of reference to draw upon. However, what about a new frame of context? In this instance, the yoghurt drink was framed as an alternative to a breakfast when on the go. That opens up ideas for choice without leaving the comfort zone of the existing breakfast context. The Routine habit remains satisfied it’s not too out of the ordinary and you are able to influence people to try an alternative. Now here’s a different angle. If you understand someone’s existing Routine thinking, what can you do to divert it towards your favour? You didn’t really plan to buy that chocolate bar at checkout did you? But it’s staring you in the face and you can’t resist the impulse. If there was instead a sign saying ‘chocolate bars in Aisle 5’, you are unlikely to go to the extra effort. It’s a little bonus that disrupts your usual shopping experience in small, positive way (unless you’re on a diet). Now take a different context. You are buying a flight online. How about rental and insurance and a myriad of other things whilst you’re here? Travel websites are great at doing this (or terrible, depending on your point of view). The reality is people are more likely to act in the pre-defined moment as it saves the effort of searching elsewhere for the same thing. They know once you’re going through the motions, you’re more likely to pick up your figurative ‘chocolate bar’ along the way rather than embark on a fresh hunt. In general, most people doing the same sorts of things at same time of the day. Once you know this, you can start to guess what they are doing and provide options they are most likely to be interested in. It’s all about context and understanding their mindset in the moment. Taking this concept further, you can build up a context by amalgamating behaviour patterns. In the consumer world, by analysing patterns of products, it’s possible to understand wider needs and related products. Then when customers are offered great deals on items they really want, they will feel they have been magically understood. In fact, that’s just what happened when Target managed to work out a girl was pregnant before even her father knew. When people have a choice to make, they often take the default option. How many times have you heard a phone ring then numerous people checking to see if it’s theirs. They haven’t changed the default. It’s extra effort to go into settings and change the default font on computers- Times New Roman and Arial are everywhere. We typically accept what we’re given and don’t really want to have to go out of our way. Defaults instruct us how we carry out simple behaviours. By that logic, if you want to influence someone’s behaviour, simply change the default option you’re providing. 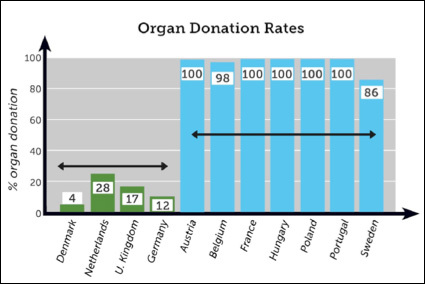 This graph shows organ donation rates in Europe. There’s a huge divide with none in the middle ground. There’s a very simple factor to this; those with high rates have a default opt in checkbox and the lowest rates require you to opt in i.e the default is to opt out. In Zimbabwe, HIV tests went from around 60% to 99% when the option of testing was changed from a default opt out to a default opt in. Who would have know a tick box could have so much to answer for? Ikea are masters at enforcing a default routine on us. You go there knowing you want a rug, but you’ll wind your way around and around the store, taking in all departments as you go. It’s actually much harder to find the shortcut to go direct to the rugs so you’ll happily accept the winding route. Before you know it, you’ve not only picked up the rug but a new lamp, set of dishes and a cuddly toy to keep the kids happy. I had the pleasure of going into Toys R Us recently and noticed they’ve done exactly the same concept of ensuring customers weave their way round the entire store. If you can hijack Routine’s default mode you can understand how people will respond and start to subtly influence their decisions. If you enjoyed this, stay tuned as there are 6 more Creatures to meet and understand. Subscribe to be the first to know.